It is my first full week after Spring Break. I have missed sleeping in and binge watching TV, but it was a great week back and I was glad to see my kiddos. We had an awesome field trip where the kids were challenged with teamwork activities on a rock wall and ropes courses. I was so proud to watch them work together to overcome fears. I love these teaching moments where kids learn these amazing life lessons about themselves and others. It is a great reminder of why I continue to teach. Even though I am back at school, I have been enjoying this spring weather and all the spring berries that come with it. I have been eating as many fresh spring berries as I can get my hands on. 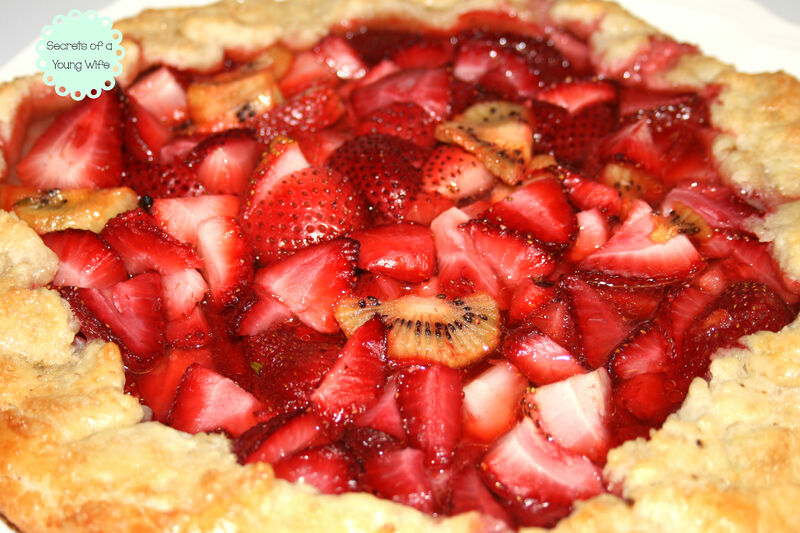 Having so many fresh strawberries on hand is what led me to bake this tart. Actually I may have mislead you a tad. 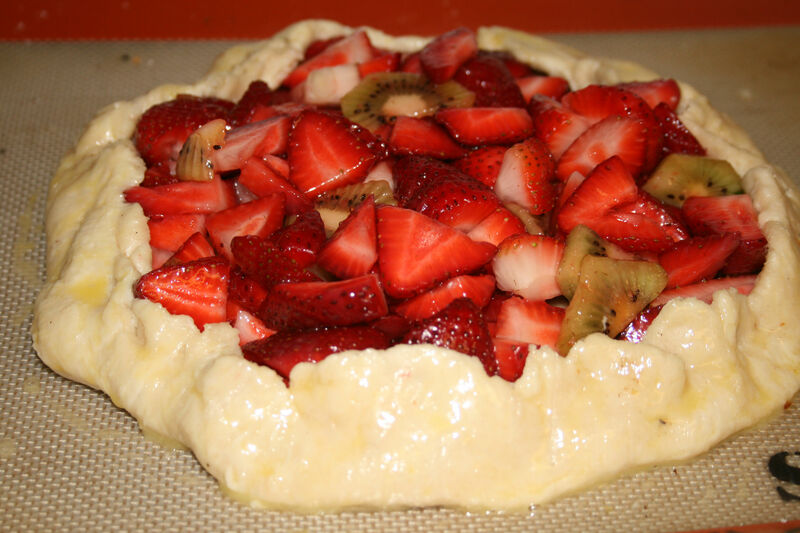 This really is a Strawberry-Kiwi Galette. A galette is just a free form tart. I think it is so beautiful in it’s rustic homemade appeal. It also makes it very easy to form, especially for people like me that are perfectionist, it takes away the pressure. Pies and tarts take so much time and I love that a galette is perfect in it’s imperfect form. For the filling: Mix strawberries and kiwis together in a bowl. Then add the sugar and vanilla, tossing well to coat the fruit. 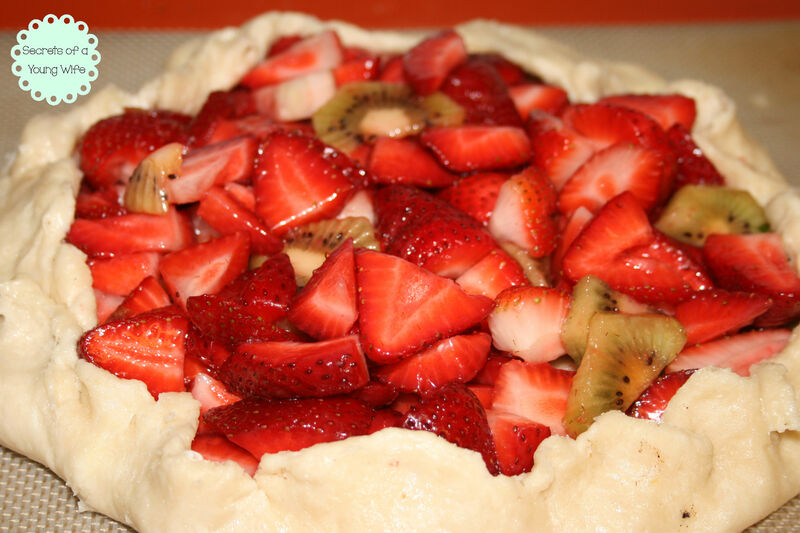 Set fruit mixture aside and allow the mixture to soak as you prepare the crust. For the crust: In a new bowl, whisk flour, sugar, and salt together. Using a pastry cutter (your hands or two knives), cut in the butter until the mixture resembles a coarse crumby mixture. Then add 1/4 cup of ice water, stirring with a fork until the the flour mixture is moist. (You may add up to 2 more Tablespoons of ice water if the dough seems dry). Gently knead the dough a few times in the bowl until it all comes together. Shape the dough into a ball and flatten it into a thick disk. Wrap the dough disk in plastic wrap and refrigerate it for at least 1 hour. Preheat oven to 425F degrees. Line a large baking sheet with Slipat or parchment paper. Set aside. On a lightly floured surface, roll the dough into a 12-inch circle. Transfer dough to the prepared baking sheet. Then carefully spoon the fruit (without the juices) into the center of the dough, leaving a 2-3 inch border (to fold over and seal the pastry with.) Gently fold the edges of the dough over the fruit. Press gently to seal the edges. Brush the crust with the beaten egg wash and sprinkle with dough with sugar. Bake for 25-35 minutes or until the crust is golden brown. If adding vanilla glaze. Mix together glaze ingredients in a small bowl. Drizzle with vanilla glaze after the oven and serve warm or at room temperature. 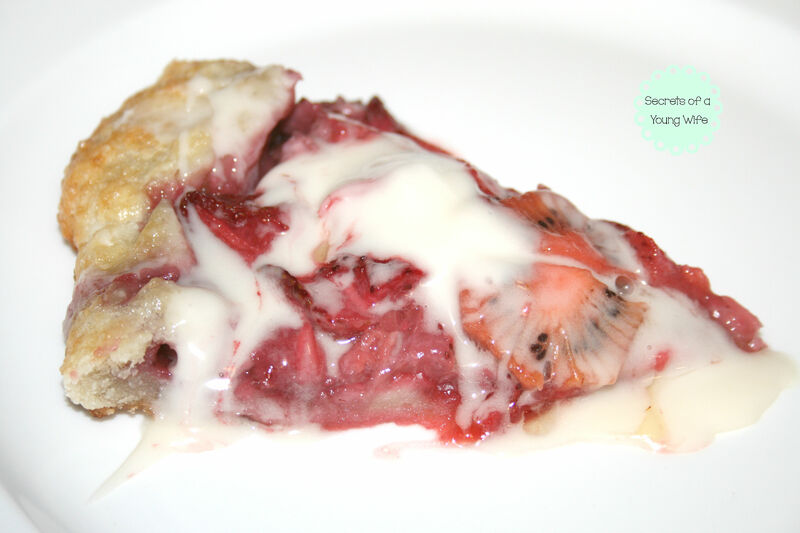 First of all, I have to say that your Strawberry Kiwi Galette looks so so so delicious! Strawberries are my favorite fruit to use in any dessert. I really think that they’re easy to work with. I’m definitely going to try making this next weekend. Thanks for the recipe! Looks beautiful, and I’m sure it tastes just as good as it looks! Thank you! Yes, a real treat!